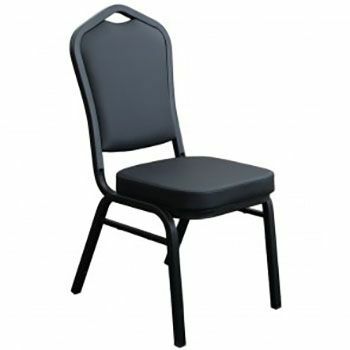 Able to hold over 1500 pounds in static weight, McCourt's Superb Chair offers strength and elegance in places such as convention centers, banquet halls, restaurants, meeting rooms and fellowship halls. The chair's stylish high crown back not only contributes to a classy ambiance, but also provides a handle for easy transport. The Suberb Stacking Chair is made to last. The welded frame with a powder coat finish is meant for extreme commercial use, and the double stitched seat perimeter provides extra durability to the cushions. We even offer a full one-year warranty against upholstery seam failures and frame damage due to materials and workmanship under normal use. The polyolefin fabric is strong while remaining colorfast and resistant to stains and odors. McCourt also manufactures a Chair Truck by EVENTrux™ that holds 10 Superb Chairs each that you can see here. It will make moving, set-up, tear-down and storage of your McCourt chairs easy! 18 gauge steel square tubing. Legs, back and carriage are 13/16” square bent tubing. Braces are 5/8” square tubes. Each frame member fillet welded in a minimum of 2 places each end. Frame is finished in baked on powder coat for extreme commercial use. Seat platform is 1/2” and back platform is 3/8” hardwood plywood to which upholstery is stapled. Seat platforms are fastened to frame with #10 screws. Back platform is bolted at four interior perimeter points with #8 screws. Back cover is blind tacked to back platform. Upholstery is a Polyolefin fiber double stitching on padded seat perimeter for durability. Polyolefin fabric is strong, colorfast and resistant to stains and odors. Seat padding is comprised of 1 1/2” virgin polyurethane foam. Dust cover stapled to under seat perimeter before frame attachment. Back padding is 5/8” virgin polyurethane foam trapped by material and platform. Back cover has 1/8” virgin polyurethane foam. Chair glides are injection molded, quality polyethylene inserts featuring half circle profile for better anti rocking performance. Twelve stacking buttons are push barb style injection molded polyethylene to allow stacking up to 10 high with no marring of the adjacent frames. Seat is 15.5” w x 16” d x 18” h.
Stack of 10 measures 36” deep x 82.5” high (each chair has 4.8” stack pitch). Stack of 10 chairs ships wrapped and strapped to specialized skid maneuverable with a two wheel hand cart. Upholstery color available in Charcoal, Navy Blue, Forest Green, Burgundy, Beige or Black fabric and Burgundy or Black Vinyl. Frame is finished in Silver Vein powder coat. Full 1 year warranty against upholstery seam failures and frame damage due to materials and workmanship under normal use. Fabric tears and stains not covered. McCourt Manufacturing will repair or replace (at our option) at no charge; customer assumes all freight charges.